You can draw polygons and freehand lines, curves and circular arcs or you can use rectangle and circle functions. Areas can be filled with transparent colours or with hatchings in metigo MAP. 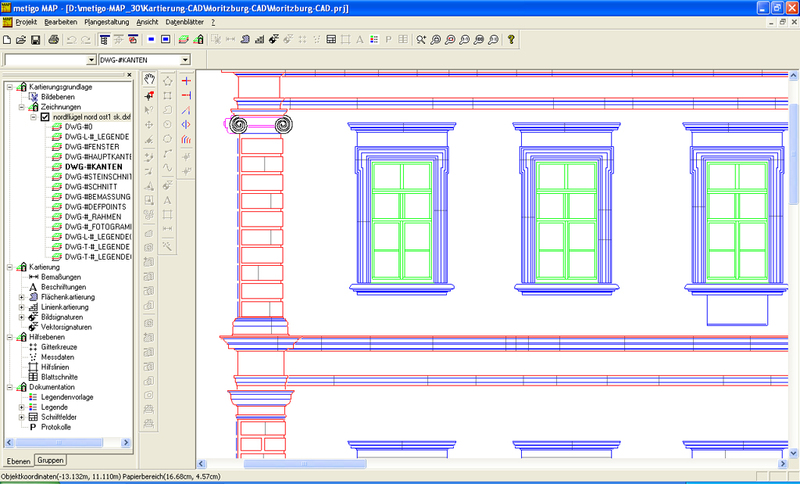 By the use of CAD functions and area interesectioning tools you easily can process your drawn elements. In metigo MAP individual mapping templates can be defined and designed using a large library of hatchings, line types and colours. Using the symbol editor you can create individual hatchings, lines, vector symbols and colours. You can control metigo MAP via project tree, menu bar or mapping dialog windows. You can customise the user interface of metigo MAP for the use at a home PC or the tablet PC on site. metigo MAP enables the user to navigate fast in the mapping project, to turn mapping data on and off at the display by selective grouping of the mapping classes. The developed software is a stand-alone application, so no further software is required. 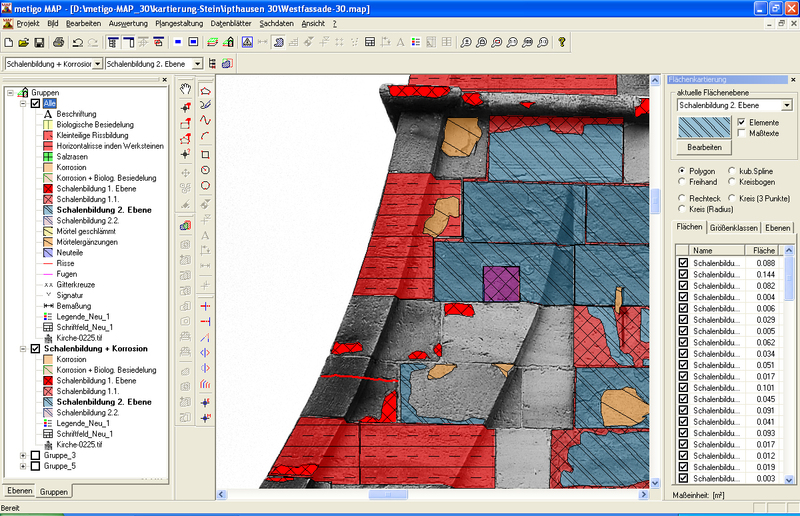 Via metigo MAP MAP's CAD interface DWG/DXF-files can be directly imported as mapping base or for the completion of already existing CAD mappings in metigo MAP. 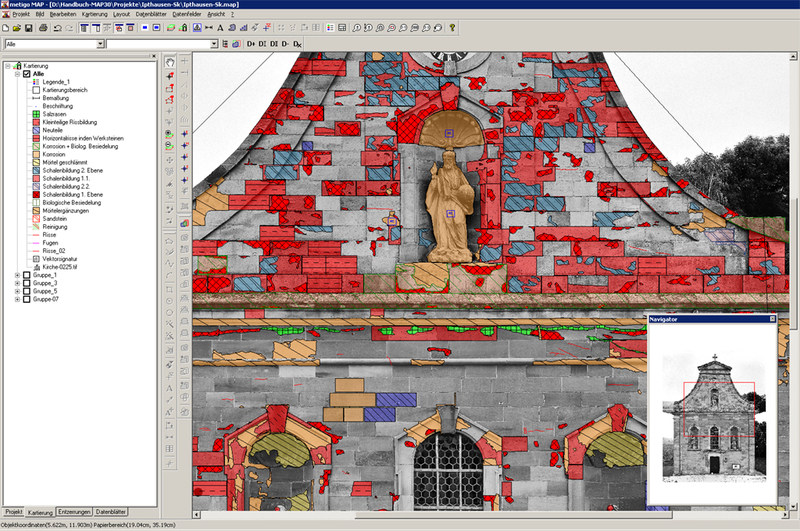 You can export the mapping to true-to-size image files (TIFF) or CAD files (DWG/DXF). 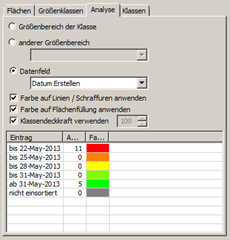 The user can create attributes (e.g. for findings or technological information on planned conservation) for every mapping class and further assign own values to them. 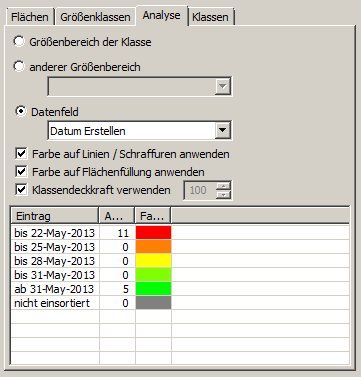 Quantity calculation and object data can be exported as a whole into text files to be processed in table calculations or databases.